Time to move the wood pile! 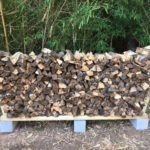 Searching the Internet for DIY firewood storage led me to this simple to build, no tools required wood rack on Instructables. I priced out the materials at my local Home Depot which came to $21.76 per rack. So far I’ve built two and I will need a few more at least. One thing I really like about this solution is that the racks are effectively temporary. I can build them up to store the wood, then tear them down and re-use the materials for other projects when I am done with them. Since I intend to build more permanent firewood storage after I get all the logs split and out of the back corner of the yard, this works out well indeed. Below are some pictures from building and using these new racks this weekend. You can see in a couple of the pictures below that I have moved the splitter to different location, still on top of a retaining wall but I will not be trampling on the new grass. This area is closer to where the woods racks are. Using the wheelbarrow makes this whole process a lot easier too. I really should have thought of using it sooner. My process is to take the wheelbarrow over to the log pile and load it up. Then I take the logs over to the splitter and stack them between two cinder blocks to keep them contained and within easy reach. The empty wheelbarrow then moves to the other side of the splitter to get filled with the split wood. Finally I take the split wood over to the rack, stack it up and start over again. The wheelbarrow saves you lots of walking back and forth carrying logs and saves your back from heavy objects!